As an old supply chain leader (professionally, pre-Gartner days) I was drawn to an article that appeared in my inbox, written to a supply chain user: “Fundamentals of Cloud Computing – What is SaaS, PaaS, IaaS and How They Affect Your Business“. I was drawn to this due to my focus on how firm’s can leverage IT (think cloud computing) to drive innovation and productivity. But after reading the article I was left with at least two gaps. As I travel around and listen to various vendor messages, it seems the ability to translate cloud and what it means to business is lacking. Worse it is downright wrong and will lead to wasted money and missed expectations. First I have to say that the article mentioned is reasonable. It captures most of what you need to know about what the ‘cloud’ is. This helps at a high level. In fact much aligns with generally accepted understanding by the wider market. But from where I sit, a non-technical business leader that looks at how business operate, and how data fuels business processes and apps, spanning lots of systems and cloud services, I feel that there are some significant gaps that ultimately lead to different decisions and different outcomes. One aspect will add another key component to the cloud ‘stack’; the second will alter that way the various parts should be viewed and this changes (or should) CEO (and other business leaders) and CIO investment plans. What are the words a CEO uses when they talk about their business? What is important to them? I would argue that all the priorities we survey, and everything you read about in the press, can be rolled up into these four categories. The challenge is how to equate these business goal and concepts to IT and specifically cloud, and how does IT and cloud actually support or deliver on each of these. Most vendors struggle terribly to make this simple connection and as a result clients don’t get it. These layers make sense from an IT perspective – these are IT terms. They are sold and positioned by vendors to very different use cases. For example, SaaS is really a dialog about standardized business applications, otherwise known as multi-tenant SaaS. Single tenant SaaS or hosted apps do not offer as much long-term profits to vendors. As such, translating SaaS to business leaders should be a discussion about efficient and standardized business processes and practices. This awareness is often lacking in many dialog’s between vendors and customers. 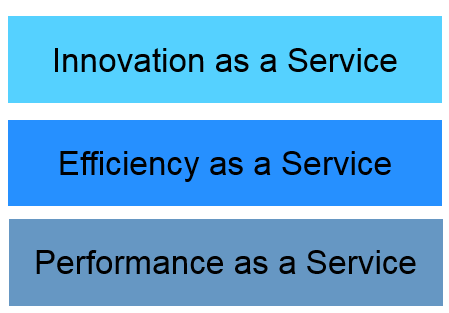 Too many vendors will use the word “innovation” in the same sentence along with ‘standardized business process. This might be innovative if your original business process was outdated; but if it was reasonably up to date, the change is not likely to yield the step-change in innovation you might assume the salesman offered you. SaaS is not going to give you that – but it provides a stepping stone to unlocking additional advantage. Just to prove my point, I just saw a vendor say (on a chart): “Simplify, Standardized, Automate, Innovate”. This was in conjunction with a standardized global ERP roll out. I won’t tell you which vendor this was – because the point is not aimed at one vendor but the overall vendor landscape. PaaS is most often sold to IT since it is seen as supporting application development. PaaS is very broad – including data management services, workflow, BPM, and a whole lot more. But what does app development offer? It provides a means for businesses to deploy or access unique, customer business apps. This is therefore a more a message related to business innovation and differentiation. This is where your standardized business processes (which all competitors can use) are extended with unique capability. Finally IaaS is actually about infrastructure – technically storage, compute and networking. It is all about elasticity and scale, on demand, as needed. This offers IT a more economic route for securing core IT services; and it also offers business users the ability to process almost unlimited amounts of data. From a business perspective, this about performance. The layers correspond to PaaS, SaaS, and IaaS in that order. 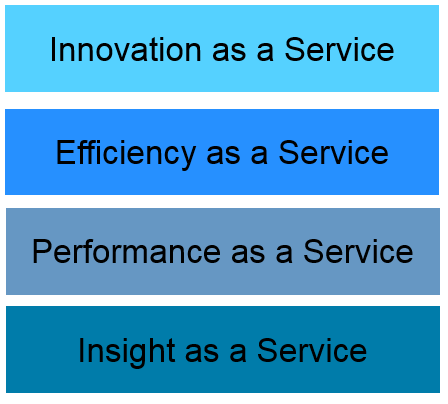 But these three “layers” don’t align neatly with the all business goals or concepts I started with. Data is missing. Analytics are missing. Decision making is missing. This is the aspect that provides additional extensions to standardized business process. Technically such services are developed, deployed and maintained more as an actual SaaS offering (if packaged) or PaaS (if build from the component services). 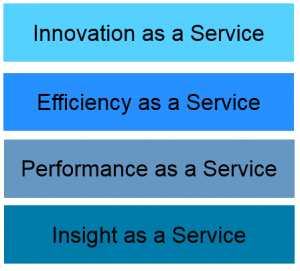 But the result is sufficiently different that we (the IT industry) ought to explain the difference – hence the concept of data as a service or insight as a service. Data or the analytics can augment either standardized business processes, supported by SaaS, or unique or differentiated business processes, supported by PaaS. Yes, Daas solutions could be built with PaaS using IaaS; SaaS solutions could equally be built using PaaS and IaaS. This is not relevant. Data and analytics is as different as standard or custom apps as chalk is to cheese. And this new layer may make more sense once you explore the second flaw in the article. These benefits will vary hugely. For example, if your current business apps are old and inflexible, a move to a modern SaaS-based business application may lead to both IT cost saving as well as simpler, more efficient business processes. This will drive business productivity. It may not yield innovation in terms of business process innovation. That may require PaaS or even DaaS. But there is value to be had here. This explains why so much “low hanging fruit” is being reported by many clients with their first cloud SssS application. But the next wave of real business innovation is yet to really get going. We need a few other areas to fall into line, one will require us to recognize the real value and role of data and analytics across the layers of the traditional cloud cake. Beyond that we need other complementary technologies, workforce skills and management capabilities to mature and align. See 2018 Won’t See a Massive Productivity Boost From AI – 2019 Might Show It. This blog is an updated version of the original from December 2017.